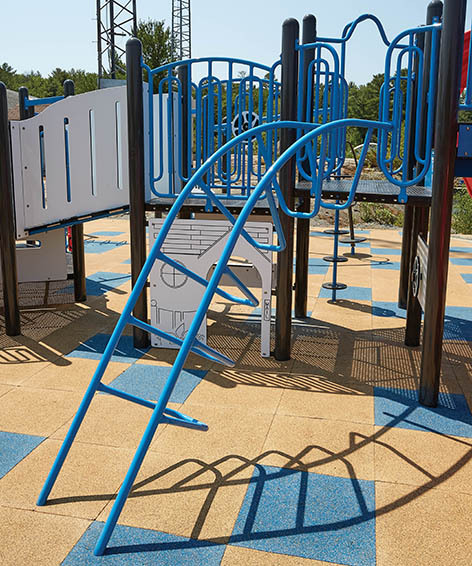 This steel climber with deep rungs and side rails helps boost climbing confidence. Cobra Climber is a mechanical assembly of climber and safety rail. Climber is a welded assembly of 1.66” (42mm) O.D. x 11 gauge (3mm) Allied Flo-Coat® galvanized steel tube structural rails, 1.66” (42mm) 1018 carbon steel tube insert, 1.315” (33mm) O.D. x 12 gauge (3mm) Allied Flo-Coat® galvanized steel tube rungs, and 0.25” x 2” (6mm x 51mm) zinc-plated hot-rolled mild flat steel. Safety rail is a welded assembly of 1.315” (33mm) O.D. x 12 gauge (3mm) Allied Flo-Coat® galvanized steel tube, 1.029” (26mm) O.D. x 14 gauge (2mm) Allied Flo-Coat® galvanized steel tube, and 0.1875” x 1.75” (5mm x 44mm) zinc-plated hot-rolled mild flat steel. Entire assembly is powder-coat painted.